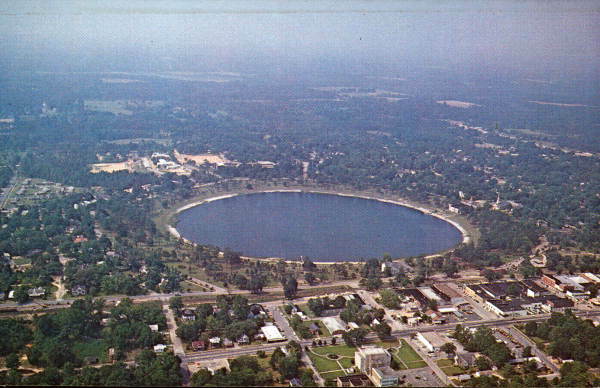 DeFuniak Springs Florida, is a small town of about 6,000 people in the northwest part of the state. It is located at the intersection of US-331 and US-90 just north of I-10, about 60 miles east of Pensacola. This little village at Lake DeFuniak started life as a small way station on the Pensacola & Atlantic Railroad. It was named after Col. Frederick DeFuniak, an executive of the Louisville-Nashville Railroad. DeFuniak was a hard-working Italian immigrant who had been an officer in the army of Giuseppe Garibaldi, the George Washington of modern Italy. He also was an office in the army of the Confederate States of America. The Colonel allegedly won the right to name the town in a card game. Descendants of Colonel DeFuniak still live in north Florida and Alabama. Members of a Methodist educational movement called the Chautauqua Assembly, headquartered in New York, further developed the small hamlet. It soon became their favorite winter retreat, growing in importance and beauty. Seemingly frozen in 19th century amber, DeFuniak Springs is one of the prettiest of Florida towns. 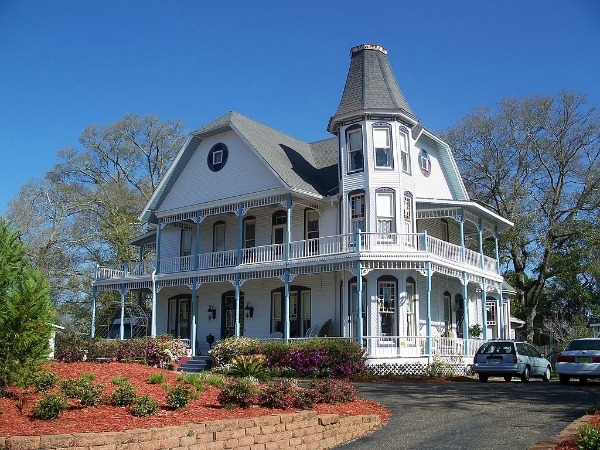 Numerous Victorian era homes encircle little Lake DeFuniak, and it's at times difficult to tell the old homes from the new ones built in the same Colonial Revival and Queen Anne styles. 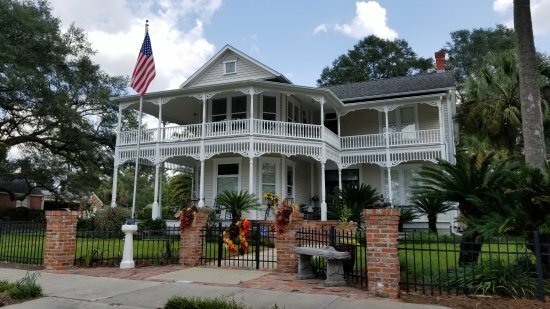 The town has around 200 historic buildings surrounding the lake, 40 or so which are listed in the National Register of Historic Places. 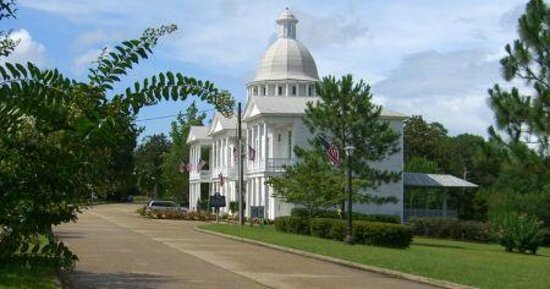 With a population of about 6,000 people, DeFuniak Springs might just have the most historic sites per capita of any town in Florida. One of the many interesting old buildings is St. Agatha's Episcopal Church. 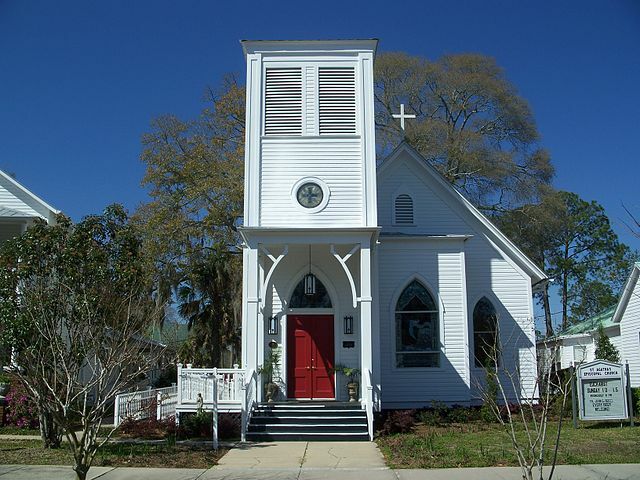 It is a Carpenter Gothic church in the town historic district at 144 Circle Drive. The church was built in 1896. Because of the old homes and Walton County's oaks and hilly terrain, DeFuniak Springs sometimes feels more like rural New England than rural Florida. Walton-DeFuniak Library. The oldest library in Florida still in use today, in operation since 1887. Some interesting exhibits inside, including an impressive collection of medieval armor from the Crusades and muskets from the American colonial era. Lake DeFuniak. According to legend it was created by a meteor, but it's most likely a sinkhole lake. Spring-fed and almost perfectly round, though perhaps not as perfectly round as Lake Kingsley 250 miles to the east in Clay County. L&N Train Depot. 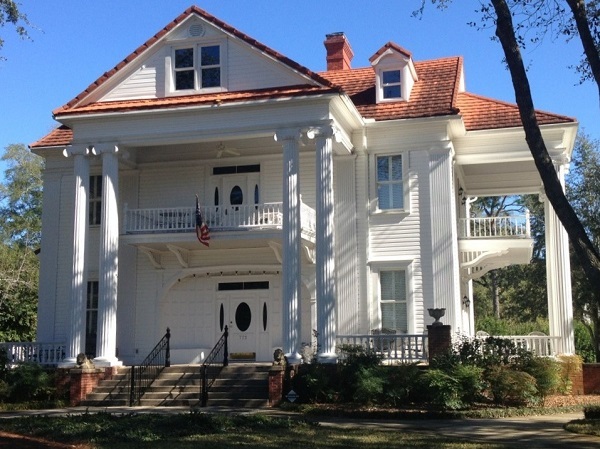 Built in 1882 and once serving thousands a day, it now houses the Walton County Heritage Museum. Chautauqua Vineyards and Winery. A good place to visit and taste some delicious wine. Hotel DeFuniak, 400 US Highway 90 East, DeFuniak Springs, FL 32433. Tel: 850-892-4383. Nicely restored 1920 hotel in the heart of historic downtown DeFuniak Springs. Loaded with antiques, reasonable rates. Bogey's is the place to eat if you are visiting DeFuniak Springs. It is located in the center of the downtown historic district. It was formerly located in the Hotel DeFuniak. Bogey's serves fresh food and has a great atmosphere and equally great service. 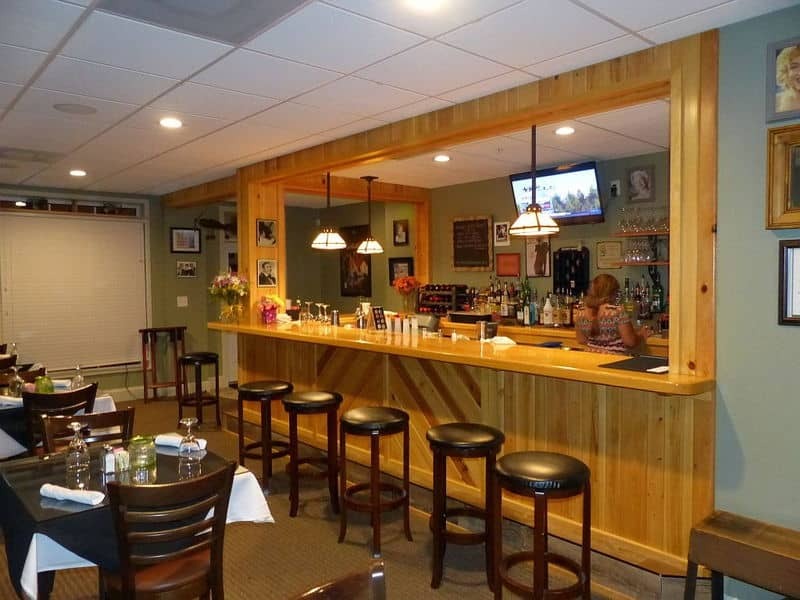 The restaurant also has a full service bar with a happy hour, and often features local musicians like a sax player and a guitarist. When you first walk into this restaurant it looks very upscale, with nice furniture, tablecloths and linen napkins, and memorabilia and art on the wall. A look at the menu will show you that the prices here are very reasonable in spite of the upscale appearance. There are photos of Marilyn Monroe, Mary Martin and Bogey himself. For you younger readers, the place is named after the famous actor, Humphrey Bogart, also known as Bogey. Bogey's has a nice selection of appetizers, including a southern favorite: fried green tomatoes. They also offer crab cakes, Bahamian shrimp skewers, crab stuffed mushrooms and other goodies. Their filet mignon and prime rib is excellent, and so are their seafood offerings. They do a great job with fish. I had blackened grouper and it was great. One of their best offerings is fresh almond crusted redfish with mango and pineapple sauce. Another less formal entree is fish and chips which comes in a large basket with 4 large pieces of grouper and plenty of tasty seasoned curly fries. Desserts are great and include chocolate cake. Bogey's is also open for lunch. You can get egg rolls, Panko crusted fish sandwiches, grilled chicken Caesar salad, and many other delicious light meals.